ADA, Mich., Nov. 19, 2018 /Christian Newswire/ -- Addiction is a crisis of epic proportions--in the U.S.-- and around the world. Its destructive wake lies in ruin around those who are or were addicted as well as their loved ones. Left unaddressed, addiction devastates relationships, families, lives, and one's own holistic health. 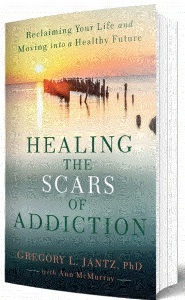 In "Healing the Scars of Addiction" by Dr. Gregory Jantz, both addicts who find it too difficult to pick up the shattered pieces of their lives and struggling believers seeking to understand the addict they love, will find comfort, compassion, and a lifeline of hope, and healing. Dr. Jantz, a go-to media authority on topics of behavioral-based afflictions, addiction, recovery, and dependency disorders is a renown mental health expert with captivating faith. He has dedicated his life's work to helping those who need his practical whole-person approach and expertise the most. and declare, "Addiction doesn't have to have the last word." Book Dr. Jantz as your guest or request the social media message he personally recorded for you to share on social media. Questions and prep document to be provided to hosts with confirmed interviews.